This is the second half of a two-part post intended to inspire graduate students and others with low incomes who are currently not saving for retirement to start. Check out the first post for my assumptions and an argument concerning compound interest. Please remember that I am not a financial planner or CPA and you should not consider my opinions financial advice targeted for your situation. I view investing during graduate school as a learning experience, if nothing more. Even if we end up with $0 at the end of grad school I’ll be happy for the lessons we’re learning. For instance, I made an enormous mistake with my retirement accounts right when I started out, and you can bet your britches I’ll never be unclear about exactly what funds I’m invested in again. (This sort of decision can be very confusing to people choosing among 401(k) options offered by their employers.) If I had made that mistake in my first year in a real job, with real money in a 401(k), it would cost me a lot more in lost returns. How to choose a company to invest with based on their expense ratios. How to choose funds that meet our objectives. Some about the tax implications of tax-advantaged retirement accounts. How to work together to make investment decisions. I say it’s best to get this practice in as early as possible, even if the amount of money you’re investing isn’t substantial. There will always be a good reason not to save for the long-term. While in graduate school, it’s because you have a low income and expect it will be easier to save after school, when you have a higher income. Once you get out though, maybe you’ll decide to replace your car and furnish your new place. Then maybe some other life events will come up that are more important to throw money toward, like a wedding or a baby. Maybe you’ll decide to aggressively save for a house downpayment, and then make repairs and upgrades the house that you buy. Those are all perfectly legitimate uses for your money and I’d commend you for paying cash for them. But just like they say about having a kid, if you wait for the “perfect” time to start saving for retirement, you never will (or at least you’ll burn years of potential compounding-time until you wise up). The fact is that if you can’t spare 10% of your income to savings (or debt repayment), you can’t afford your lifestyle. (Remember that we are assuming that your stipend is a living wage.) Because your income is fixed by your university, if you feel you can’t save it’s because your living expenses are too high. Upon realizing that, you can either accept that your lifestyle is out of whack and promise yourself that you’ll get it in line later, or you can take steps to live on what you earn now. It’s my opinion that there are only a few exceptional life situations wherein you should forgo saving for the future, such as unemployment or when paying back high-interest debt. I do not view graduate school as one of those exceptional situations. Treat it like the rest of your life and save at least 10%. I expect that Kyle and I will experience an income jump after we graduate. You probably have the same expectation. I hope it’s true for all of us, but I don’t know that it will be. Last Friday was Match Day for fourth-year medical students. My Facebook News Feed was exploding with announcements of residency placements for many of my friends. However, 5% of US medical students didn’t match with a residency (source). That doesn’t mean that their lives are over, but it probably means that those students will not remain on the (lucrative) career path that they had anticipated when they entered medical school and (likely) took out tens or hundreds of thousands of dollars in loans. I’m sure you have also heard about the bleak picture for graduating law students. More than a third of graduates haven’t found full-time work in their field nine months after graduation (source). It has become such an issue that the law schools are finding ways to fudge up their graduates’ employment numbers. Any one of us could become a victim of a soft economy (ask the college graduating class of 2009! ), but something more personal could happen as well. You could become disabled. You could move with a partner to a location that doesn’t offer jobs in your specialty. You could shoot for a tenure-track faculty position and end up cobbling together adjunct teaching positions. The political climate could shift and funding could be cut in your field. You could decide to enter the nonprofit or public service world. I’m not saying this to scare anyone, but I am trying to warn you not to put all your eggs in your future-income basket. Do what you reasonably can now to prepare for the long-term and don’t bank on your best hope of what the future will entail. I hope that you have been motivated to save for the future despite your student status and low income. 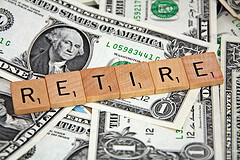 I think the Roth IRA is a great choice of retirement account for a student who has earned income. If you’re not sure whether or not you have earned income, check back on Tuesday for my participating post in a movement of bloggers all writing about Roth IRAs on that day. Do you agree or disagree with the arguments I presented in this post? Are any of them your personal motivation for saving while in school? 23 Responses to "Why You Should Save for Retirement While In Graduate School Part 2"
Emily, you have some great points here! I think a lot of it depends on how and when you are funded during graduate school. I was only guaranteed a TA position for 9 months, earning anywhere from $1200-$1500/month. My friends in the sciences may have had a 12 month position earning $2000 a month – and that’s a significant difference. During graduate school, I took out student loans but I also invested in my Roth. When I finished my Ph.D., and we were facing an overseas move, I decided to liquidate my (relatively small) Roth. It was a conscious decision, since my husband didn’t have a job in hand and the cost of living is higher here in Australia. In 9 months, my retirement fund here is already at $13,000. I knew that I would save a lot of money once I had my “real” job, and that has proven true. But overall, I agree with your sentiment and I think that a Roth is a great investment option for graduate students. I agree that in most of the US $1200-$1500/mo 9 months out of the year is not a living wage. The good (?) thing about being paid that way is that you are forced to save for the rest of your year so it creates some good habits even if you don’t have much left by the end of 12 months. I’ve read some arguments for using the Roth as a savings account/emergency fund instead of a retirement account. Were you able to avoid the penalties? I’m glad that your expectations of post-PhD retirement savings have been realized! Yep, we avoided penalties. I had started by Roth before the economic downturn, so it lost a substantial amount of money. Even though I had invested in it regularly for 8 years, I ended up just about breaking even at the end. I suppose that’s good news! I’m not in graduate school, but I only started saving for retirement this year. I should have done it earlier, so I could have put away more money! I think my argument applies to financially independent undergraduates if they are working and not taking out loans. Congrats on opening your account! I wished I had started my Roth IRA during undergrad, even if that meant saving $100/mo. I guess I don’t have that regret because I was still dependent on my parents during undergrad. In principle I guess I should have been giving and saving a certain percentage of my pay from my small job, but probably that would have left me asking my parents for money since I largely spent my pay on groceries. I’m OK with how it worked out. I think the most important thing, as highlighted in Part 1, is to graduate debt free. Certainly, if you can squeeze a few bucks into a Roth without taking on debt, go for it. And as you highlight, is an excellent habit to get in to. Also, I would stress that being young only happens once, and to make sure you don’t leave a bunch of, “I wish I had’s” on the table. One of the cruel jokes life offers up is that we tend to think life gets simpler and easier as time ticks on. Very good point. I do struggle with balance. I think what’s helping is trying to be really clear on our priorities. Missing a friend’s wedding is a definite “I wish I had” but forgoing cable is no big deal in the scheme of things. Your last sentence is what I was trying to get at in points 3 and 4. Cultivate your good habits now and don’t assume you’ll be able to easily create them later. #3 is an EXCELLENT comment. I know people that drink and eat out all the time and don’t save a thing. they live large but it catches up with them. I think learning how to cook is an investment that pays major returns. Thankfully I enjoy it and it’s a bit of a hobby. yeah why not if you have the means, right? But more than 90% of students can’t think of this with their in-college income. SB @ FPR recently posted..Credit Karma Review, How Reliable is Credit karma? Well, I assume you just made that statistic up – I really don’t know what percentage of graduate students have the means. But in absolute numbers, there were over 600,000 graduate students in the science, engineering, and health fields in the US in 2009 (http://www.nsf.gov/statistics/nsf12300/pdf/tab46.pdf). The PhD students among them are almost certainly being paid a living wage, and many of the master’s students have some income as well from fellowships or research assistantships. Then you add in all the non-sci PhD students who are on fellowships or being paid for teaching or research… There are a lot of students out there earning money! Great two posts, really nice to hear from a fellow grad student about how retirement IS a factor now. I do want to point out though, in response to this comment, NIH current pay is just over $22,000 for a PhD student. That’s gross, of course, and thus it’s around $18,500-$19,000 (tax dependent) net for 12 months. As NIH usually funds science, engr., etc, that’s the “high mark” right now and it’s still barely a living wage for many people…especially if you are dating seriously, married, have kids, and other issues that come up while in grad school. When coupled with another grad salary (like say, my musician husband’s 9 month, $800 net paycheck), it can end up being less than a living wage if there is a long commute (higher transport costs) or housing costs. That said, we do alright and with parental support are able to save the max to a Roth (almost) every year but without that, we’d barely be able to save anything (<$100) on the salaries we get. Living wages, while a nice idea, aren't very feasible for those married/not in the "high pay" fields. Definitely the stipends, if they are even meant to support one person, can support ONLY one person. I think it’s a fair assumption though. I actually know only two grad students who are married to someone who makes less money than they do (and those are lifestyle choices) and most who are married have a spouse with a “real job.” Unfortunately there are some others like you and your husband for whom that hasn’t work out. The NIH suggested stipend is a bit silly as it doesn’t take into account the cost of living in various cities like you mentioned. My grad stipend offers varied from about 18k$ to 28k$, very tied with the cost of living of the area. Did you read my post on the living wage calculator I found? (http://evolvingpf.com/2012/03/how-does-your-salary-compare-to-the-living-wage/) It might be interesting for you to compare your stipend to the living wage in your city. It turns out ours is generous enough to live fine in Durham, as we have observed.